a 60 mile radius. **NOTE: Pick up distance can be extended - Depending on year/make/model. 7. Will start & run boat on-site prior to purchase. We are the largest #1 volume pre-owned dealer in Texas and surrounding states. 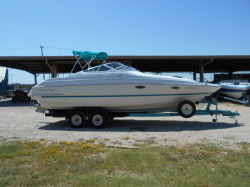 DFW BOATS has established our name worldwide by having the best deals out there! mind about purchasing a pre-owned boat. We encourage and welcome all customers to have a pre-buy inspection prior to purchase. We DO NOT In-House Finance. and ALL major holiday weekends. click on navagation link to the left of our home page. *WE START AND RUN ALL VESSELS PRIOR TO PUTTING ON CONSIGNMENT. *UNFORESEEN TRAILER DAMAGE/BIMINI TOP DAMAGE/MISSING ACCESSORIES ETC. WE DO TRY AND LIST ANYTHING OBVIOUS ON OUR WEBSITE DESCRIPTION. AT THE EXPENSE OF DFWBOATS.COM. THAT YOU PAY TO SHRINK WRAP VESSEL. AND FLAP AROUND DAMAGING HULL AND COVER. OR WITH REMOVABLE CUSHIONS IN BOAT.